Athlyn Green enjoys whipping up tasty dishes in her home kitchen. 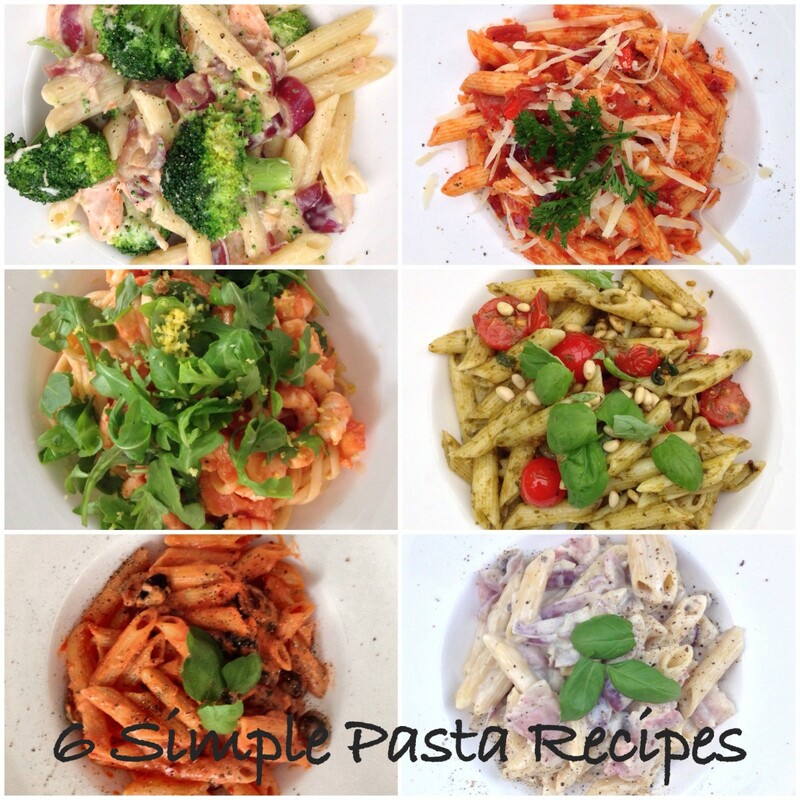 She's received many requests for her recipes and is happy to share these. Homemade noodles truly are a special treat. Once you master the art of noodle-making, you'll find yourself making your own noodles again and again. If you're a fan of comfort foods, these noodles are hard to beat. They are just so satisfying and filling. You can quickly make a batch of noodles. This is especially handy if you want to add more ingredients to a soup and don't have pasta on hand or if you are shy on side-dish ideas. 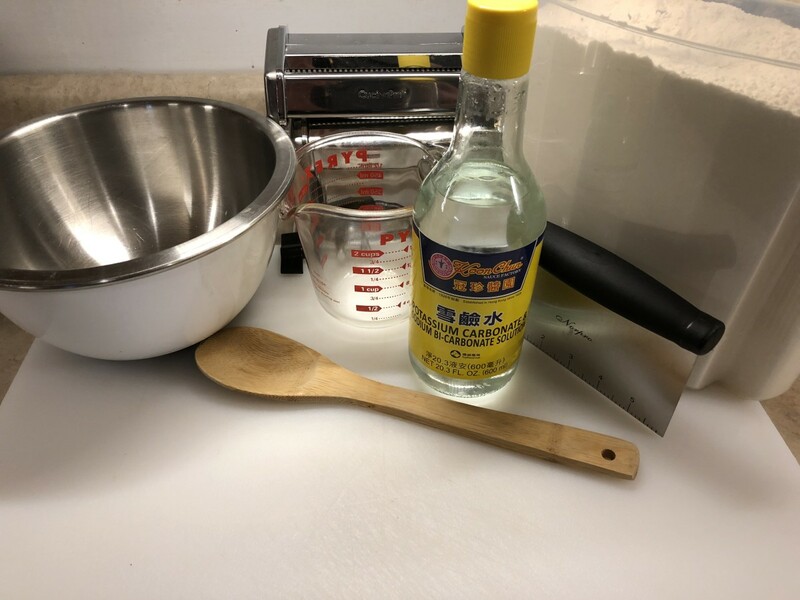 If you've always wondered how to actually make homemade noodles, use the noodle recipes below to make your own noodles! Rolling Pin: Use a heavy & smooth rolling pin so the dough rolls out more easily. This also helps reduce the amount of dough that sticks to the pin. I like to use a marble one. You can also use it to cut your noodles in a straight line.Why struggle with trying to make straight cuts free-handed? Pizza Wheel: This will help you cut noodles effortlessly. Slotted Spoon: Use this spoon to lift noodles out of the water. If you need to cook a second batch and want to save your hot water, this will help you to do so. Scraper: Remove hardened dough from the counter with a scraper. Making homemade noodles is easy as 1-2-3 with any of the recipes below. Pay particular attention to my noodle-making tips. Pasta dough is stiff, and it takes some kneading. For someone starting out, they might conclude that their noodles are a flop because the dough doesn't "feel right." Noodle dough has a different texture. Be patient, work it with your hands, and you will be surprised at the finished product. Your noodles may look crude, but once they cook up, you will be glad you tried your hand at it. The process gets easier as you do it. These days, I think nothing of putting on a batch of homemade noodles. I always make enough so I can freeze some for a future meal. Scramble the eggs with a fork. Add the salt, flour, and cream. Mix everything with a wooden spoon (or use the hand-swirl method). Add liquid to moisten flour until a dough ball forms. Knead until it's light and smooth. Roll it out on a floured board. 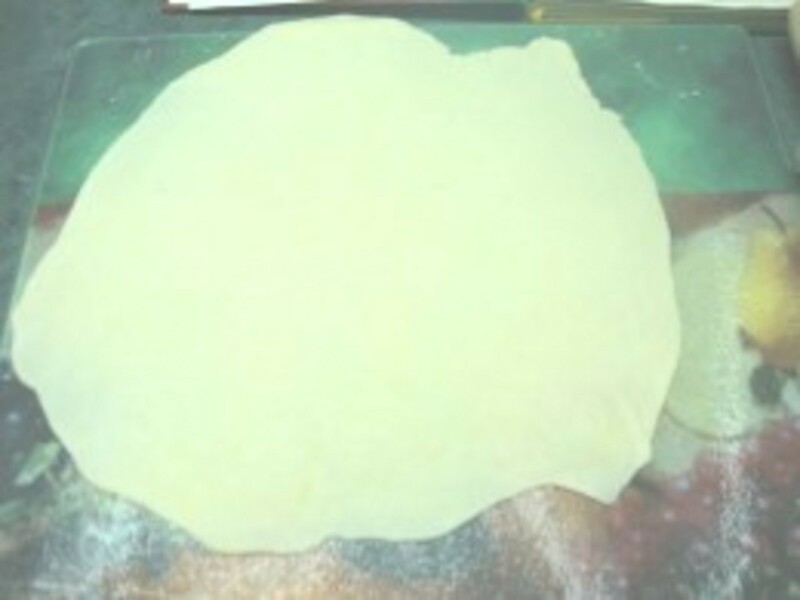 Keep working and rolling dough (adding flour) until it is no longer sticky. Roll out the dough until it is quite thin. It will puff up when cooking. Cut your noodles with a knife or a pizza wheel. Making homemade pasta noodles with a pizza wheel saves time and is so much easier. If you don't have cream, don't worry! Simply use one of the other recipes in this article. I pretty much make noodles with whatever ingredients I have on hand. Want to make a small batch of noodles? 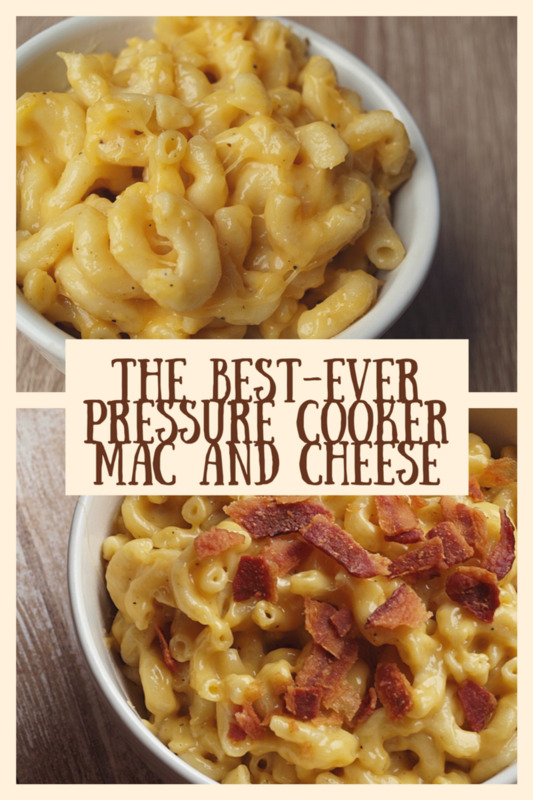 This recipe is perfect for two servings! Knead well. Then, roll it into thin sheets on a floured surface. Cut the dough into long strips. Cook the noodles in boiling water until they float. Knead the ingredients until the dough is smooth. Roll it out on a floured counter and cut it into strips with a pizza cutter. Drop the noodles into your soup about 10 minutes before you're ready to serve. 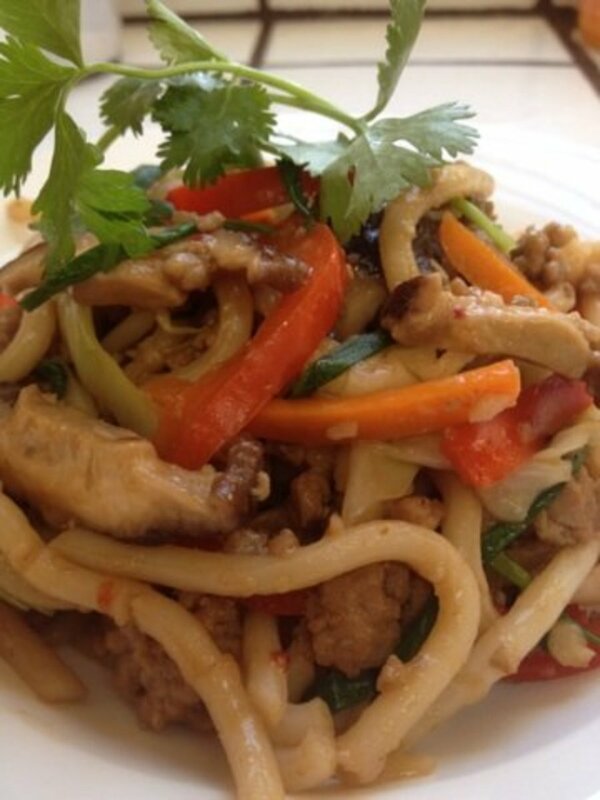 These noodles are tender and have that velvety texture you only find with the handmade variety. This is a good all-around basic recipe to keep on hand. To reduce dough stiffness, make a moister dough. Use the hand-swirl method to mix your dough. Simply swirl your hand in a circular motion to mix the ingredients until a ball forms. This means you don't have a sticky wooden spoon to clean up, and the ingredients will mix easily. 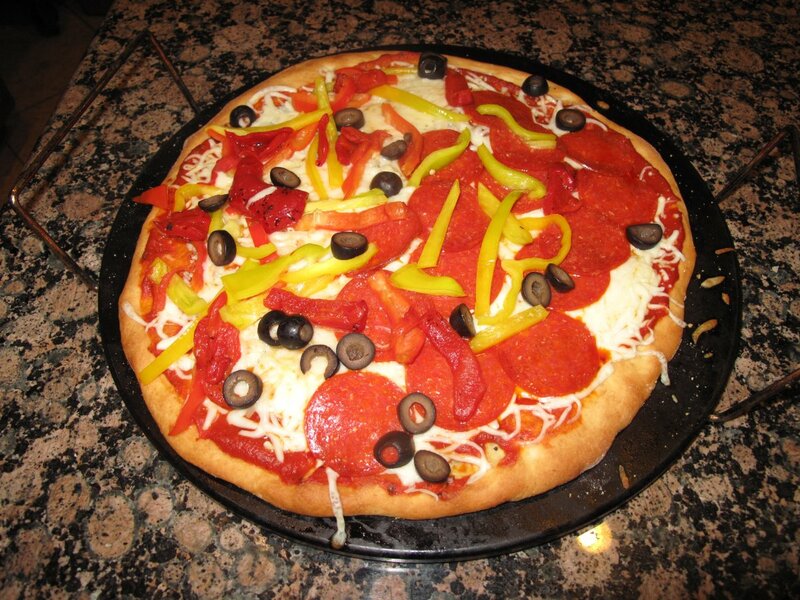 Use a pizza wheel instead of a knife to effortlessly cut noodle dough. 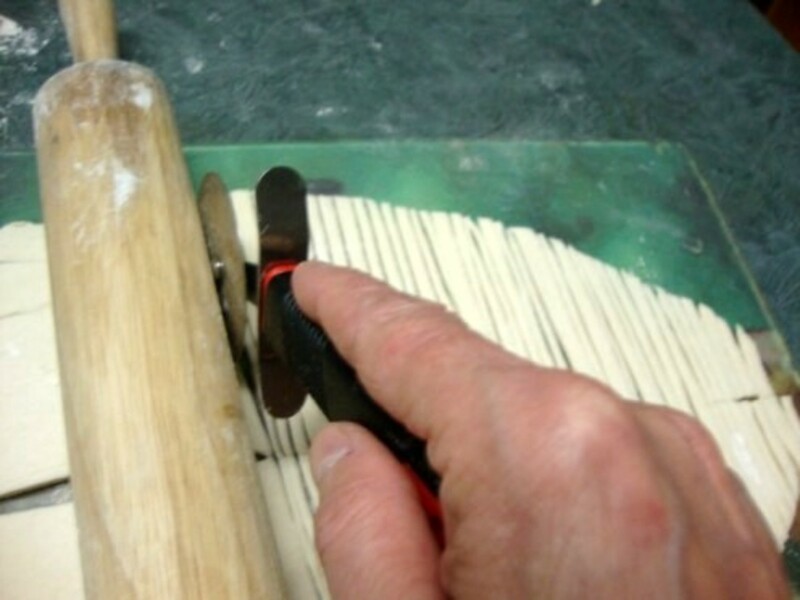 Use your rolling pin as a straight edge when cutting out noodle strips. Once you've used one of the five recipes above to make the dough, you'll notice that it feels stiff—this is normal. The key is to continue kneading the dough until it becomes smooth. Flour the counter. Once the dough forms into a ball, place it on the countertop and work it by heeling in the flour until everything becomes smooth and free of small lumps. You will develop a feel for how the dough should feel. Cut your dough into palm-sized portions. If you can, use a marble rolling pin instead of a wood one. The weight helps to roll out noodle dough, and the smooth marble surface picks up less dough that you have to clean off later. Make sure you roll your dough out on a board. While a counter is ideal for cutting the noodles, you don't want to scratch your countertop. Sprinkle flour over the top of your noodle dough and roll it out thinly. Your noodles will puff up as they cook. You don't want the noodles to become overly thick and heavy during the cooking process. I confided to a friend that the worst part of noodle-making was trying to cut them with a knife because they would stretch. My friend suggested using a pizza wheel and said that his relatives always used one to cut their noodles. The very texture of noodle dough is such that if you try to cut it with a regular knife, it stretches and (sometimes) tears. A pizza cutter makes the process one hundred percent easier. The wheel effortlessly slices through the dough, and you will cut long strips of noodles in record time. Go up and back down to make for faster cutting. Continue going down the dough until you've cut it all into strips. A couple of noodle-making sessions will give you a feel for making them at home. Once you get into the process, you'll be able to quickly whip up a batch. This is especially handy if you want to add more ingredients to a soup and don't have pasta on hand or if you are shy on side dish ideas. Roll the dough out into a large thin rectangle onto a floured counter. Instead of slicing noodles into thin strips, use your pizza cutter and cut dough horizontally and vertically, basically a tic-tac-toe pattern. Cut on the small side. You will have flat, thin squares, which make nice soup noodles. Drop these into homemade soup, and enjoy! Flat, square pasta is great for Italian-style dishes. Get creative with your homemade noodles and plan to make interesting shapes. Cutting your noodles on the diagonal will result in diamond-shaped noodles. Drop your noodles into boiling water and cook until they float. Reduce heat to avoid boil-over. Scoop noodles out with a slotted spoon (and place in a strainer) to save your hot water, then drop in the next batch of noodles. You can serve your noodles immediately. Reheat noodles you plan on using later in the day. Drain the noodles in a strainer. You can use either a metal or plastic strainer to do the job. It doesn't hurt to give them a shake, which helps to remove excess moisture. If I'm going to freeze my noodles, I like to spread them out on a tea towel. The towel absorbs excess moisture, which helps to reduce the formation of ice crystals. Plastic bags make good containers for freezing noodles. I place a thick layer in each bag, and then these bags can be stacked. 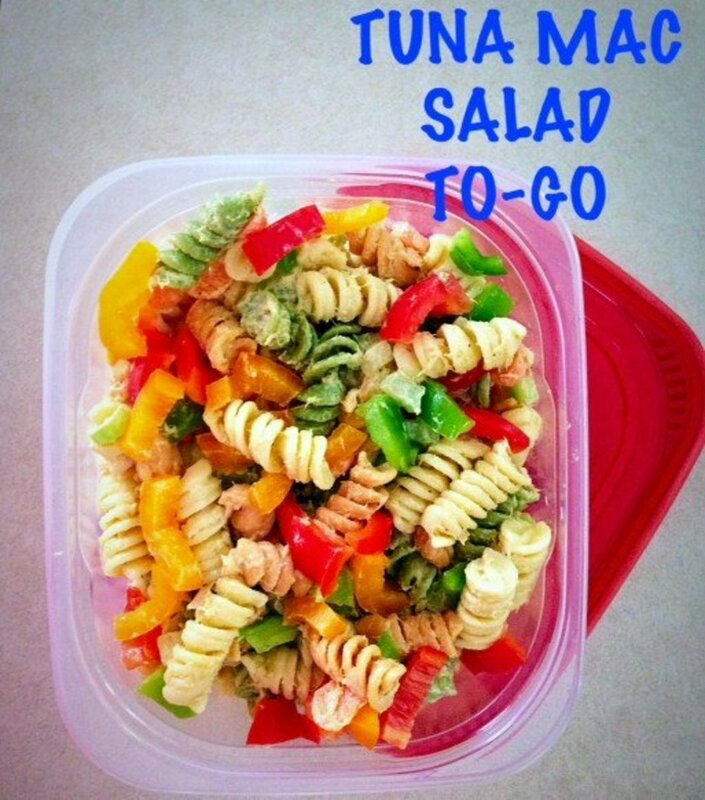 A freezer container can also be used, depending on your portion size. 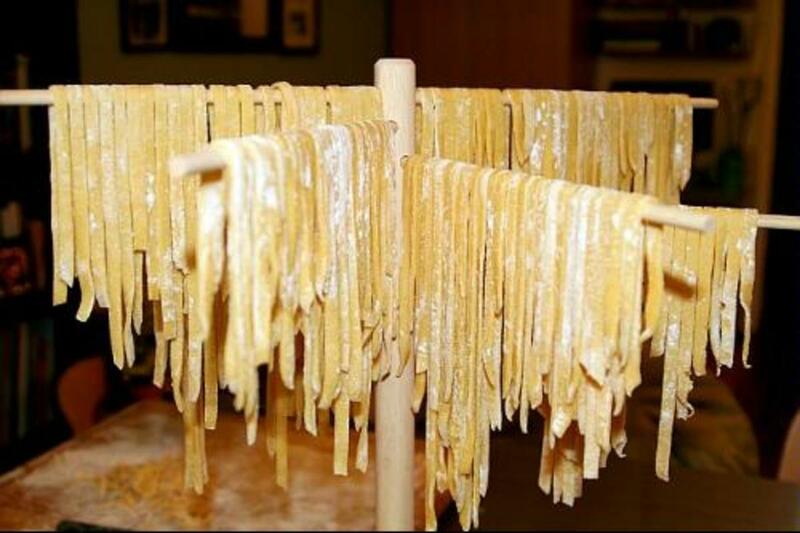 If you prefer to completely dry your homemade noodles, inexpensive drying racks are available—and preferable to using a chair back (as was done years ago) or a broom handle. Place your fresh noodles on a drying rack and allow to completely dry. Store as you would for regular pasta. Once you've made your homemade noodles, how will you serve them? Noodles can be served using the suggestions below. Plain: Serve fresh noodles with butter, salt and pepper, and seasonings of choice. 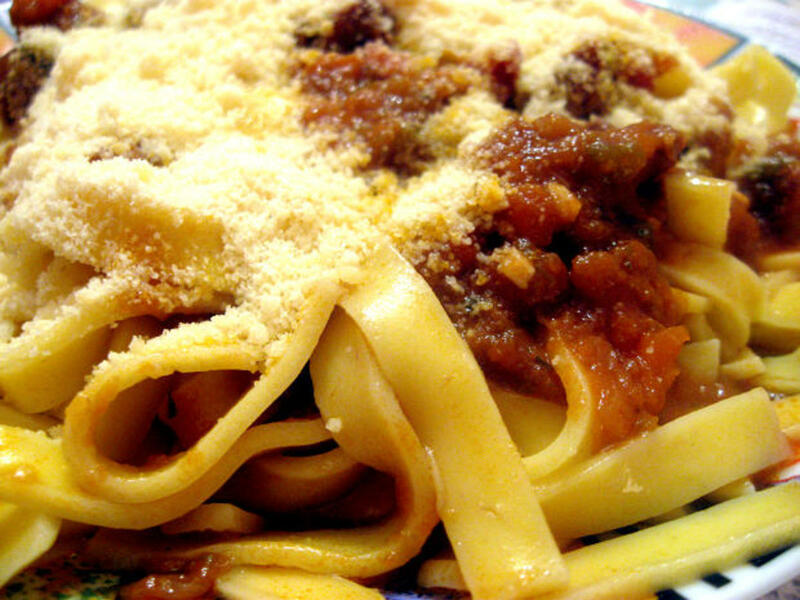 Topped With Spaghetti Sauce: I like to make whole wheat noodles and top them with spaghetti sauce. Italiano Noodles: Toss noodles with olive oil, salt and pepper, basil, crushed garlic, and parmesan. Top with sliced black olives. Chicken and Noodles: If you've baked a chicken, make a gravy with the broth and top your noodles with it. Serve homemade noodles alongside baked chicken for a hearty old-fashioned dinner—sure to become a family favorite! 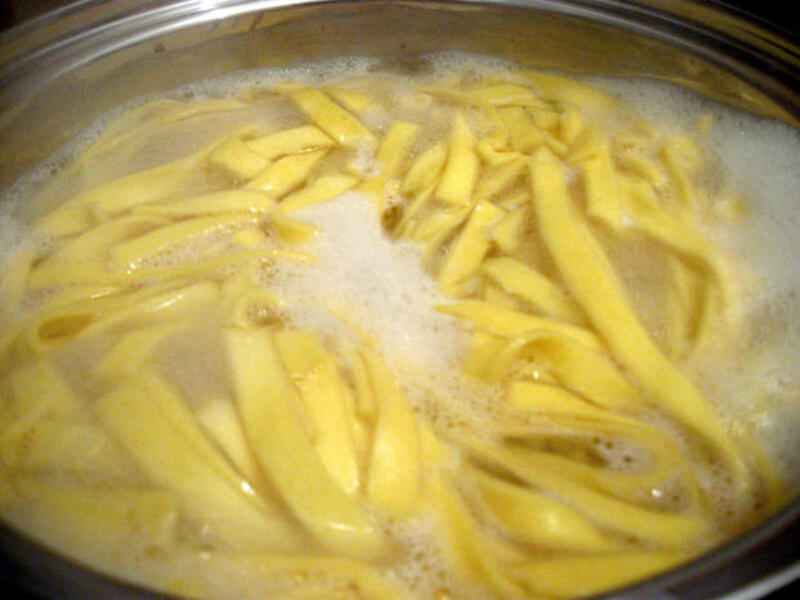 Noodle "Chips": Place the noodles in a greased roasting pan and drizzle oil over them. Bake until crispy and golden brown. Dip noodles in your dipping sauce of choice. 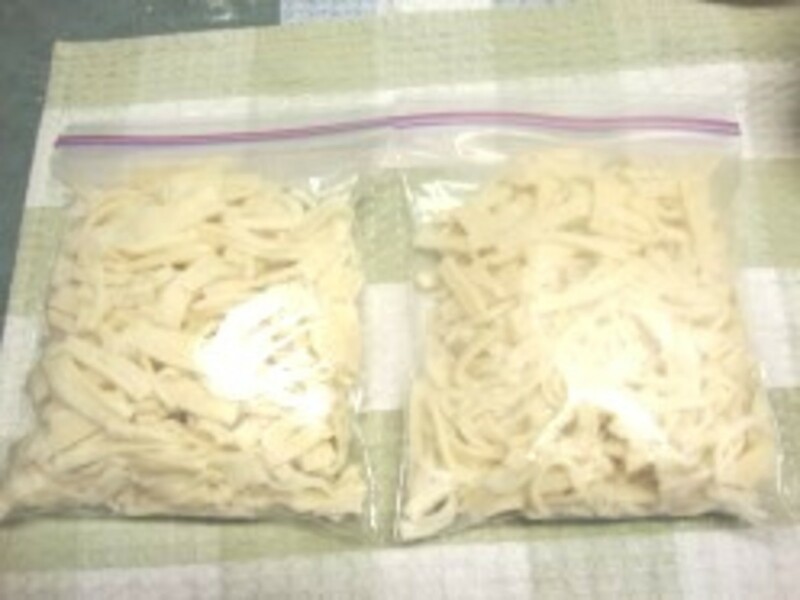 Cheesy Noodles: Place noodles in a greased casserole dish and, when warm, toss with butter. Top with grated cheddar and serve when the cheese is bubbly. Chicken Noodle Soup: Homemade noodles have a velvety consistency and go particularly well in homemade chicken noodle soup. Prepare the soup and drop in a handful or two of frozen noodles before serving. Once you've rolled out your noodle dough and cut all your noodles, you can make short work of your clean-up with a scraper. Scrapers come in a metal or plastic material and are ideal for removing hardened bits of dough and flour from counters. I prefer plastic or rubber to reduce scratching. These truly are fabulous clean-up tools. I love the velvety texture of homemade noodles. I make mine ahead and freeze them. I recently had a crowd in and defrosted and then placed my homemade noodles in a large casserole dish. I added my cream sauce and kept all warm on top of the stove. Everyone served themselves and enjoyed it. If I'm shy on groceries, a simple plate of homemade noodles, topped with butter and Parmesan or with a cream sauce makes a satisfying meal. 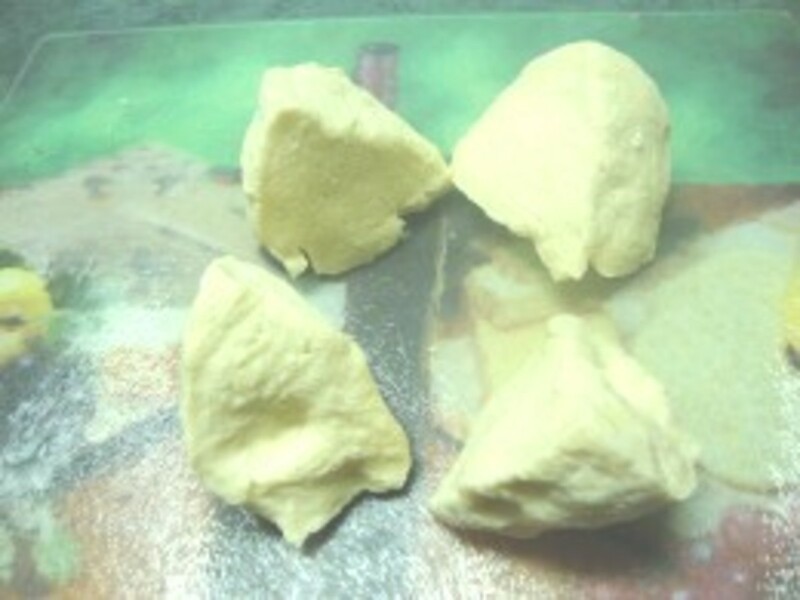 After you've tried a couple of these recipes, you may find that you do as I do: I simply dump a handful or two of flour into a bowl, shake in a bit of baking powder and moisten it with water. I don't measure the ingredients. I've made noodles so often now that I could do it in my sleep. They turn out just as velvety every time. I sometimes add olive oil to my dough if I have it on hand. Someone asked me the other day, "Why would you make homemade pasta?" They mentioned that pasta in all different shapes and sizes was as near as the local market. To a person who has never sampled the homemade variety, this would be a relevant question. Why would anyone bother going to the effort of making noodles when, in modern times, we have access to an unlimited supply at the grocery store? Then, I was invited out for dinner at a farm. The hosts prepared a lovely meal—in one of the serving bowls, I noticed some white ragged and uneven things. I asked what they were, and the hostess told me I was looking at homemade noodles. Curious, I asked her how she made them. She said she didn't use a pasta machine or any type of cutter. She made her own noodle dough and cut her noodles by hand. She mentioned she had done this before we arrived. I was surprised and asked her, "Don't you have to dry the pasta first before cooking it?" "No," she replied. "I make my pasta dough and cut out my noodles and drop them into the pot like I did tonight." Huh! Slap me silly. You really do learn something new every day. To be polite, I thought I would try the odd-looking, crookedly cut noodles. I took a small portion and ladled gravy on top. I expected tasteless dough that was masquerading as pasta. Instead, I bit into what can only be described as "pure velvet." They were fantastic! These noodles were nothing like their store-bought counterparts. From that moment, I was hooked and decided that I would master the art of noodle-making. 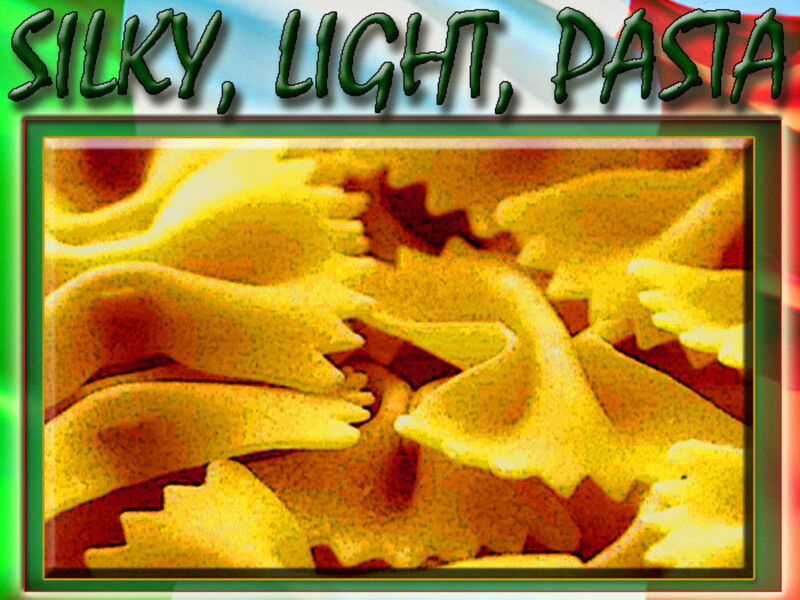 When I came home, I set about learning how to make my own homemade pasta. 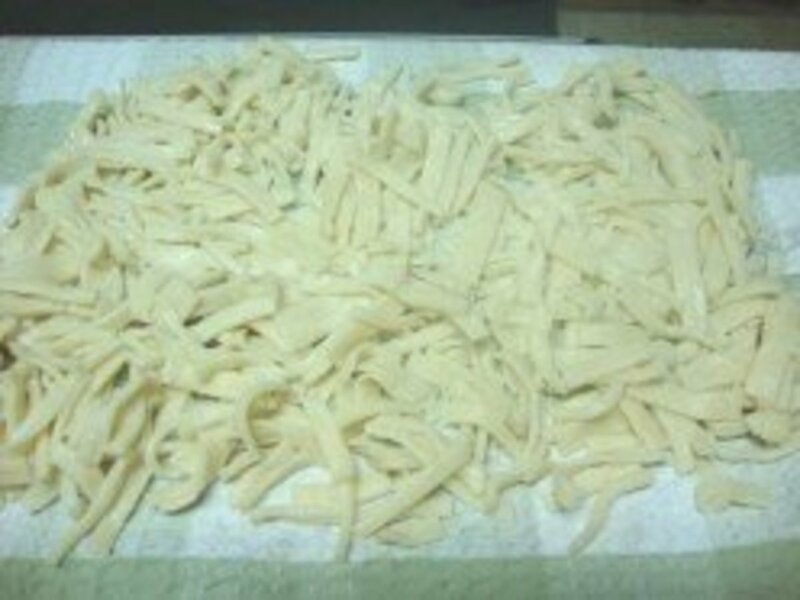 I've now added homemade noodles to my repertoire of recipes I make again and again. I recently had a crowd coming over. I baked a ham, placed my homemade noodles in the casserole dish with the ham, and poured cream sauce over it. My guests raved over the meal. They, too, had never sampled homemade pasta and loved it! Have you Tried Making Homemade Noodles? I'm Going To After Reading This Hub! Thank you. They really are easy to make. You make it look so easy! I can't wait to try this myself! After you have your dough rolled out, if you roll it together like you would for cinnamon rolls, it makes cutting them so much easier and you can make them as thin or thick as you want. A lil trick my grandmother passed on!!! Delicious recipe! I would love to learn to make this next year! Thanks for sharing! It is very easy. And each time you do it, it gets easier. I can now make a batch of noodles in minutes. I plan on making noodles to take to thanksgiving dinner..thank you so much for all the detail..I hope it is as easy as it seems.. They look tasty.. Voting it up. Thanks for the recipe. Hi Cathie, these are so good. I read your profile. Wow! What a strong woman. Yes, you can make homemade noodles and once you do it a time or two, you really get on to how the dough should feel. Kneading is the trick that gets it right. I've made pasta both wayrs, with a hand-cranked pasta maker and using a pizza wheel. I prefer the pizza wheel. The electric pasta makers look promising. I'm more of a "back-to-the-basics" type and like doing things as people would have done in the past. I dislike too many appliances cluttering my counters! I also homeschooled and it is amazing how much better children do and how their intelligence actually increases. My son returned to the later grades in high school and was an honor student. Wow!! Great hub, and thank you for answering my question. I always thought you needed a pasta maker for this, I'm definitely going to try this. Thank you, Thank you!! 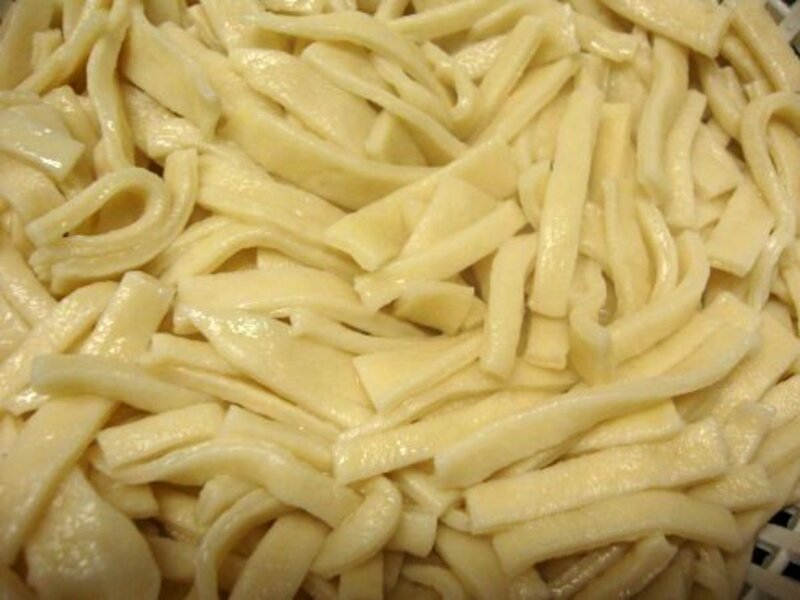 If you fold your noodles over and cut in layers, you will have to make sure you have flour between the layers. A pizza cutter makes cutting noodles very easy and quick. These homemade noodles are so good with a rich cream sauce of dropped into chicken or turkey soup. much easier to cut if you roll out, cut in half, stack one half on top of the other, cut in half again, stack again and then cut into thin strips. That way, you are cutting multiple layers at a time, and your noodles are more evenly cut, which makes them cook more evenly too. That sounds like a great idea for drying homemade noodles. Thanks for sharing! No drying rack, plastic hangers work perfect.Just hang them off your cabinet knobs. For servings, it would depend on which recipe you used. Just remember, when making homemade noodles, to use a pizza cutter. This makes short work of cutting your noodles into strips and is so much faster than trying to cut them with a knife. Once you've tried making homemade noodles a time or two, it becomes much easier. Remember to knead the dough. It will be stiff but once it is rolled out and cut, your noodles will be fine. Knowing how to make homemade noodles can be convenient if you are short of pasts or low on cooking ingredients. 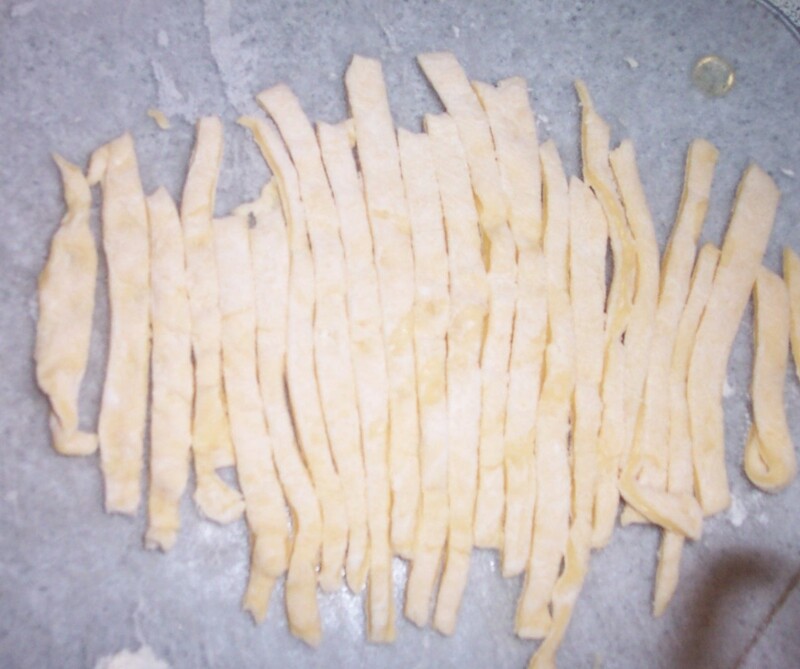 It is relatively easy to make homemade noodles, especially if you use the right tools. I remember trying to cut them, until a friend suggested using a pizza wheel. What a difference! Thankz for this, been watching NHK recently and there was a program showing how to make them but forgot to record it, so this will be a great tutorial. Let me know how you make out, Ben. Thanks for stopping by! Lovin' your style here Athlyn! My wife and I are going to use the a couple drops of milk recipe, we've got the pizza cutter ready! Can't wait to try to dry some too! Awesome!!! They are really easy to make once you try them a time or two. A friend, who was from Italy, suggested I use a pizza wheel to cut them--and that really made a difference. The noodle dough can tear if you use a knife and the wheel produces noodles in seconds. You don't even have to dry your noodles before using. These are wonderful served with a meat dish. I have always loved homemade noodles but had no idea where to even start when making them. Thanks for the great recipe! Me too! I find the nooodles are fine, cut and used right away. Others might prefer to dry them, if they had a drying rack. I usually freeze the remainder. And I agree about the flavor. Homemade noodles are unbeatable, not only for flavor but for texture. Hello ... I make my noodles homemade... I cut my noodles but I dont dry them... after they are cut I go ahead and put them right into my broth and chicken .. it gives it a good taste and not only that it. it takes 1/2 the time for prep. You know, for the longest time, I thought: Why would anyone go to the trouble of making noodles when you can buy them? . . . Until I visited a friend and sampled some. From that moment, I was hooked!! My first attempts weren't stellar but now I have the process down. My parents made wonderful homemade noodles - the thought has been haunting me lately. Thanks for the inspiration! I love noodles! Thanks for this! I didn't even know that we could make them at home! I'm so daft! I love noodles! I have to try and make them at home. Thank you for this recipes!